Netholi Peera Vattichathu means, ‘Anchovies in crushed coconut mixture’. 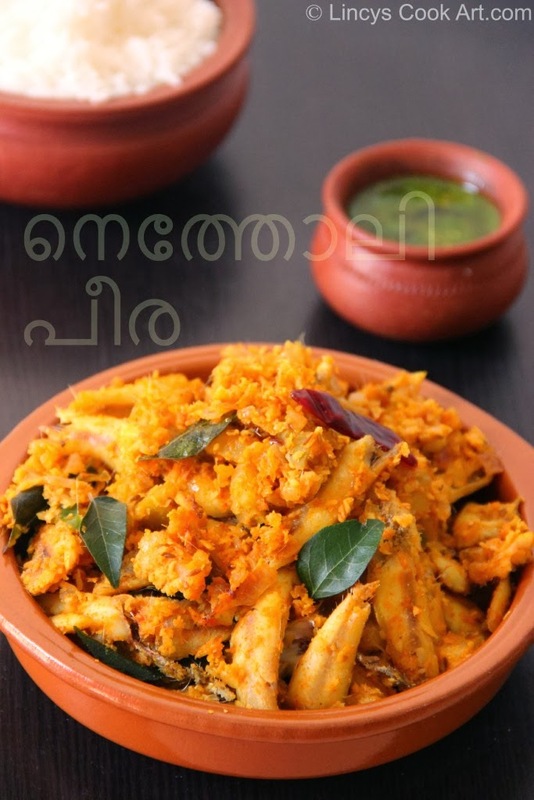 This recipe is a Kerala Nadan Style recipe. So tasty dish prepared in minutes. Whenever I think about this dish my mouth starts to water that much tasty. Generally Meen Peera prepared using Kudampuli as a souring agent. As everyone knows Anchovies and mangoe perfect combination. So we are using mangoes for this recipe. I have slightly modified the recipe by adding more onions (Sauteed) in this recipe. If you are running out of time, you can follow the traditional recipe by crushing all ingredients onion, green chillies, turmeric, chilli powder, ginger or garlic, coconut, curry leaves together as a coarse paste (Chathachu edukkuga). Add this paste with a quarter cup of water with anchovies mix well and close with a lid and allow cook for 10 minutes till the water dried totally (Thoran texture). In a blender coarsely grind coconut with garlic and jeera. In a shallow pan add oil then add onion and cook till it starts to become soft. Then add green chillies and curry leaves. Add anchovies (drain all water) and salt. When the colour of anchovies starts to change and water oozed out from anchovies almost dries add turmeric and chilli powder. Then add mango dont stir much because the fish tends to break. Cover it and cook for two minute. Then add the coconut mixture and mix once and cook for a second till garlic smell leaves. Add more curry leaves if you wish. Kothippikkalle.. :) Very nice and inviting netholi peera. Very tempting fish recipe. Thanks for sharing. Nice recipe Lincy. I luv anchovies and this recipe is making me drool!